To Cite: Moradabadi A , Ahmadi A , Kahbazi M, Sarmadian H, Arjomandzadegan M. FLASH-PCR as a Simple and Efficient Method for Detection of Brucella spp. Infection, Jundishapur J Microbiol. Online ahead of Print ; In Press(In Press):e14463. doi: 10.5812/jjm.14463. Background: Brucella spp. are Gram-positive, rod-shaped, and spore-forming bacilli. Brucella abortus and B. melitensis are the main causes of brucellosis. Objectives: The aim of the study was to establish a rapid and simple molecular method for the detection of this disease. Methods: Forty-five Brucella spp. were isolated from blood samples using the BACTEC Fluorescent 9050 system and were detected by anti-IgM or IgG Brucella specific antigen. DNA extraction was conducted on all samples. Fluorescent amplification based specific hybridization (FLASH-PCR) test was utilized to detect the 351-bp fragment from eryD gene, which was specific for Brucella spp. Results: A 351-bp fragment resulted from PCR reaction and showed the accuracy of designed primers. This fragment was successfully amplified in the FLASH-PCR reaction. In this study, we have positive and negative samples and a standard method. In addition, we calculated the sensitivity and specificity of this method as 100%. Conclusions: Results of the study was proved that the FLASH-PCR method was a rapid, sensitive, and safe method for the detection of Brucella genome in whole blood samples of patient harbored brucellosis and is recommended for routine usage. The etiologic agent of brucellosis, Brucella spp., is a Gram-positive, rod-shaped, and spore-forming bacillus (1). The bacterium is facultative intracellular coccobacilli that adapted to the reticuloendothelial system. It remains an important public health problem in developing countries (2). The genus Brucella consists of 6 Brucella spp. (3), which among them Brucella melitensis and B. abortus are the main causes of brucellosis in human (4). The Brucella infection has so many side effects such as decreased fertilization in bovine also decreased raw milk production (5). On the other hand, the treatments have also numerous side effects due to the use of antibiotics. Prolonged treatments and antibiotics may cause anemia and thrombocytopenia during antibiotics usage (6). Dairy products in unpasteurized form or entering of the bacterium via human mucous membranes or injured skin to blood from secretions of an infected animal can cause Brucellosis in human (4). The main symptoms of brucellosis are fever and myalgia that could be further complicated by severe symptoms (7). Brucellosis should be differentiated due to overlapping with other pathogenic conditions such as malaria etc. (1). Wright, Coombs wright, and 2ME as serological tests and culture are currently the main tests for the detection of brucellosis (8). These methods pose a serious threat to personnel of the laboratory because the infection is easily transferred through cultural methods (9). In endemic areas such as Saudi Arabia, some false positive results were observed in serological methods (10). The introduction of DNA-based methods such as PCR (11, 12) is an attractive way for the detection of brucellosis. Several investigations demonstrate that PCR is a rapid test for the detection of brucellosis (13, 14). The PCR method is more sensitive in comparison to culture and is specific for detection (15, 16). Newby et al. used three approaches (SYBR Green I, 5’-exonuclease, and hybridization probes) to detect B. abortus in a real-time PCR assay. They find all three methods have comparable sensitivity, providing a linear assay over 7 orders of magnitude (from 7.5 ng down to 7.5 fg) (17). The Flash-PCR is as sensitive as other PCR-based methods are. Moreover, no post-PCR electrophoresis is needed (18). The FLASH-PCR like real-time PCR uses the closed tube method and prevents contamination of the FLASH PCR reaction with peripheral DNA belonging to the other samples (19). The aim of the present study was to investigate for modification in FLASH-PCR method using a hybridization probe with a fluorescent label and a quencher allowed a quick analysis of results without using electrophoresis (20, 21). In this new method, we used a closed tube with minimum contamination also, this method does not need an expensive instrument similar to real-time PCR, but our material can be used in real-time PCR method too. Total of 45 patients (ages 15 - 60 years, 20 females, and 25 males) enrolled in this study written informed consent was obtained from the patients to use their blood in this study. The patients who is younger than 18 the parents’ consent was obtained. All of them have confirmed symptoms of brucellosis and had high anti-Brucella antibodies. Blood samples were collected for routine culture and serologic methods (22). BACTEC (Battle Area Clearance, Training, Equipment, and Consultancy) 9050 system was used to isolate the Brucella spp. from blood samples. In this method, we used 7 mL of blood from patients; after 1 week, the positive samples in the BACTEC system cultured in Brucella agar media and incubated at 37°C, 10% - 5% CO2 during 48 - 72 hours. In Brucella agar, the colonies were isolated. We also use the biochemical tests in differentiating Brucella spp. such as oxidase reaction, urease reaction, catalase test, and H2S production test. Serological tests, including anti-IgM or IgG Brucella specific antigen detection, were used by standard tube agglutination method with or without 2ME to detect the acute and chronic phase of the disease. The interpretation of serologic tests described titer ≥ 40 as positive for brucellosis. QIAGEN FlexiGene DNA kit (Hilden, Germany) and kit of Roche Applied Science (Laval, Quebec, Canada) for DNA isolation from blood were used for DNA extraction. The DNA of the patients’ blood, which were suspected to brucellosis and approved by BACTEC blood culture, were extracted. The DNA extraction kit product was measured for DNA concentration and performed by the Nano Drop® at a wavelength of 260, thus the absorption ratio of a pure sample DNA at a wavelength of 260 nm to 280 nm was recorded: (A260/280). In this study, designing of primers and probe was performed by vector NTI11 software. The specifically designed primers for Brucella genus had the following sequence: EryD-F: 5’-GAAAGCGCATCGTCTCATCG-3’, EryD-R: 5’-TGGGCGGCCTCACGCGCAATTT-3’. The segment of the most common species of Brucella, being about 351-bp, was amplified. The total volume of materials in PCR reaction was 25 µL and consisted of master mix (Amplicon) 12.5 µL, primer forward 1 µL primer reverse 1 µL DNA 1 µL, and 9.5 µL H2O. Then the samples were placed in Eppendorf thermal cycler, and the PCR program was as follows: initial denaturation for 5 minutes at 95°C, followed by 35 cycles as: denaturation at 94°C for 20 seconds, annealing for 30 seconds at 62°C, and extension for 30 seconds at 72°C. In addition, the final extension step was done at 72°C for 5 minutes. Then the samples having positive amplicationwere investigated on agarose gel 2% containing 0.1 µg/mL cyber safe color electrophoresis gel and 100-bp marker (SMOBIO, Cat. No: #DM2300). Analysis of the PCR amplification results in FLASH format (15). It was performed by a probe of the molecular fluorescent and synthesized in the area of among the EryD amplified by the later primer. The Brucella specific probe had the following sequence: EryD P: 5’ -FAM-AGGCCGTTG CCGACGGCGCGGT-BHQ1- 3’. The results of the microbiological and serological tests of blood samples are summarized in Table 1. In this study, the entire patients are positive for the serological standard test tube and culture in the BACTEC Fluorescent 9050 system. Also, we isolated Brucella spp. form blood agar or Brucella agar and performed the biochemical assays for Brucella spp. The designed primers amplified the EryD gene that was specific for Brucella spp. The amplicon was a 351-bp fragment that was expressed within a gene encoding a regulator of Ery operon. In fact, the EryD gene is responsible for erythritol catabolism in Brucella spp. (Figure 1). The amplified fragment was used to detect amplification by a labeled specific probe. The probe labeled by a reporter of FAM at 3’ end and a quencher of BHQ at 5’ end. When the amplification was performed, Taq polymerase started the amplification through 5’ to 3’ end, but the probe exists in the middle of the amplification region. Since Taq enzyme has a specific role of 5’ to 3’ exonuclease to degrade the probe, this enzyme causes separation of FAM, as a reporter, from BHQ, as a quencher. Consequently, an increase in fluorescence intensity is evident. Then the fluorescence can be detected by the FD-12 apparatus that was used to evaluate the results (Figure 2). In this study, we calculated the sensitivity and specificity by positive and negative samples, which reported by the standard method. This study showed FLASH-PCR can detect all positive and negative sample similar to the cultural method and this means PCR had 100% sensitivity and specificity. We used EryD gene to detect the brucellosis. This gene is required as a transcription factor for Brucella spp. Our results show this gene is specific for Brucella spp. detection because the primers were explored in other bacterial genomes and no product was detected. In comparison between the PCR method and cultural method, 13 cases were negative in culture method, but they were positive in the FLASH-PCR and serological tests. All positive cultural samples were also positive in FLASH-PCR method. These data are summarized in Table 2. The comparison of the three methods showed a different percentage between them and it is summarized in Table 3. In this comparison, the serological method was used as the gold standard because we should investigate false negative in the cultural method by FLASH-PCR. The serological method was a screening test and had false positive reports, but the false negative reports were not significant. In this study, we used a new PCR method that reduced the detection time of brucellosis and it has either specificity or sensitivity of 100%. This result confirmed by another study that used conventional PCR like Baily et al. (11) and Fekete et al. (23). Because of the prevalence of brucellosis in developing countries, new diagnostic methods should be upgraded for the detection of brucellosis. Although the cultural method is a definitive way for brucellosis diagnosis, this method has several defects in the performance such as long-term isolation through in vitro conditions (4 to 6 day in the best conditions), in some cases about 27 days take to isolate the species (1). Another defect in the cultural method is that the Brucella spp. need some nutritious media and condition for growing (24). The cultural method is not repetitively a potent test and has a different report in some studies; the sensitivity of this method is about 52 to 90 percent. The sensitivity depends on the clinical form of disease, chronic and localized form is more appropriate. The serological method in the diagnosis of brucellosis is the screening test, so it has several defects such as significant false positive reports, but it is fast and easy to perform. The main defect of the serological tests is a false positive case after completing the treatment (24). The PCR method offers an alternative choice and available method for the detection of the brucellosis. Fast detection of B. abortus and B. melitensis by PCR provides a good opportunity to rapid diagnosis of brucellosis (25). The visualization of PCR results by electrophoresis is a laborious and long process, which is ineffective and leads to inevitable contamination under large-scale screening to the contamination by amplification products (15). In this study, the FLASH-PCR method was successfully evaluated for the detection of the Brucella genome in whole blood samples. This method used fluorescent dye in Brucella spp. detection, helped the operator to prevent trans-contamination of the bacterium, and also helped in diagnosis without Interfering factors. The FLASH-PCR method used for Leishmania detection by Moradabadi et al. (18) used a positive control (cultured parasite) and negative control in setting the method in Leishmania detection. This study was designed to amplify the target region on ITS2-rRNA, thus the DNAs were extracted from paraffin-embedded tissues. The control and sample results showed that this method was sensitive and specific for the diagnosis of Leishmania spp. Also in a study to compare the detection of Mycobacterium tuberculosis by FLASH-PCR and culture method by Morad Abadi et al. (19) showed the FLASH-PCR method has higher sensitivity but lower specificity than culture method. They work on sputum samples of suspected M. tuberculosis patients to compare the methods. Altogether, the FLASH-PCR is a sensitive, closed tube, cost-effective, fast, and safe method for the diagnosis of brucellosis. Our finding showed that FLASH-PCR was a rapid and accurate method for the detection of Brucella spp. The current modified FLASH-PCR protocol is recommended for detection of brucellosis as a rapid, sensitive, and specific method. The authors would like to thank all colleagues of IDRC and vice-chancellor of research, Arak University of Medical Sciences for their kind contribution. Authors' Contribution: All the authors contributed to different parts of the research. Study concept and design: Alireza Moradabadi, Mohammad Arjomandzadegan, Hossein Sarmadian, Manijeh Kahbazi, and Azam Ahmadi; acquisition of data: Alireza Moradabadi and Mohammad Arjomandzadegan; analysis and interpretation of data: Alireza Moradabadi and Manijeh Kahbazi; drafting of the manuscript: Alireza Moradabadi and Hossein Sarmadian; critical revision of the manuscript for important intellectual content: Alireza Moradabadi and Mohammad Arjomandzadegan; statistical analysis: Alireza Moradabadi and Azam Ahmadi; administrative, technical, and material support: Alireza Moradabadi and Mohammad Arjomandzadegan; and study supervision: Manijeh Kahbazi, Hossein Sarmadian, and Mohammad Arjomandzadegan. Conflict of Interests: The authors declared that they had no conflict of interests. Ethical Approval: The study and the study protocol was approved by the Ethics Committee of Arak University of Medical Sciences (IR.ARAKMU.REC.1394.125). Funding/Support: The authors report receiving research grants and honoraria and consulting fees for speaking from Arak University of Medical Science. Patient Consent: Written informed consent was obtained from the patients. 1. Elfaki MG, Uz-Zaman T, Al-Hokail AA, Nakeeb SM. Detection of Brucella DNA in sera from patients with brucellosis by polymerase chain reaction. Diagn Microbiol Infect Dis. 2005;53(1):1-7. doi: 10.1016/j.diagmicrobio.2005.03.011. [PubMed: 16054326]. 2. Smith LD, Ficht TA. Pathogenesis of Brucella. Crit Rev Microbiol. 1990;17(3):209-30. doi: 10.3109/10408419009105726. [PubMed: 2154232]. 3. Meyer M. Current concepts in the taxonomy of the genus Brucella. Animal brucellosis. 1990:1-17. 4. Davies CR. Zoonoses. Eds. S. R. Palmer, Lord Soulsby and D. I. H. Simpson. Oxford Medical Publications 1998. Pp. 640; 250 photographs, 100 figs. Epidemiol Infect. 1999;122(2):347-50. doi: 10.1017/s0950268899231986. 5. Jansen W, Linard C, Noll M, Nöckler K, Al Dahouk S. Brucella-positive raw milk cheese sold on the inner European market: A public health threat due to illegal import? Food Control. 2019;100:130-7. doi: 10.1016/j.foodcont.2019.01.022. 6. Taherahmadi H, Moradabadi AR, Nazari J, Kahbazi M. Antibiotic induced hemolytic anemia and thrombocytopenia among pediatric patients admitted to intensive care unit. Iran J Pediatr Hematol Oncol. 2019;9(1):9-16. 7. Young EJ. An overview of human brucellosis. Clin Infect Dis. 1995;21(2):283-9. quiz 290. [PubMed: 8562733]. 8. Alton GG, Jones LM, Pietz DE. Laboratory techniques in brucellosis. World Health Organization; 1975. 9. Staszkiewicz J, Lewis CM, Colville J, Zervos M, Band J. Outbreak of Brucella melitensis among microbiology laboratory workers in a community hospital. J Clin Microbiol. 1991;29(2):287-90. [PubMed: 2007637]. [PubMed Central: PMC269755]. 10. Al-Sekait MA. Seroepidemiology survey of brucellosis antibodies in Saudi Arabia. Ann Saudi Med. 1999;19(3):219-22. [PubMed: 17283457]. 11. Baily GG, Krahn JB, Drasar BS, Stoker NG. 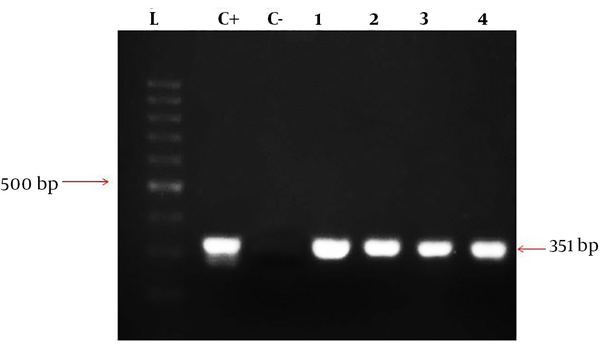 Detection of Brucella melitensis and Brucella abortus by DNA amplification. J Trop Med Hyg. 1992;95(4):271-5. [PubMed: 1495123]. 12. Herman L, De Ridder H. Identification of Brucella spp. by using the polymerase chain reaction. Appl Environ Microbiol. 1992;58(6):2099-101. [PubMed: 1377903]. [PubMed Central: PMC195734]. 13. Matar GM, Khneisser IA, Abdelnoor AM. Rapid laboratory confirmation of human brucellosis by PCR analysis of a target sequence on the 31-kilodalton Brucella antigen DNA. J Clin Microbiol. 1996;34(2):477-8. [PubMed: 8789045]. [PubMed Central: PMC228827]. 14. Morata P, Queipo-Ortuno MI, de Dios Colmenero J. Strategy for optimizing DNA amplification in a peripheral blood PCR assay used for diagnosis of human brucellosis. J Clin Microbiol. 1998;36(9):2443-6. [PubMed: 9705371]. [PubMed Central: PMC105141]. 15. Abramova SL, Ryazantsev DY, Voinova TM, Zavriev SK. Diagnostics of phytopathogen fungi Septoria tritici and Stagonospora nodorum by fluorescent amplification-based specific hybridization (FLASH) PCR. Rus J Bioorgan Chem. 2011;34(1):97-102. doi: 10.1134/s1068162008010135. 16. Beck J. Polymerase chain reaction assays for the detection of Stagonospora nodorum and Septoria tritici in wheat. Phytopathol. 1995;85(3):319. doi: 10.1094/Phyto-85-319. 17. Newby DT, Hadfield TL, Roberto FF. Real-time PCR detection of Brucella abortus: A comparative study of SYBR green I, 5'-exonuclease, and hybridization probe assays. Appl Environ Microbiol. 2003;69(8):4753-9. [PubMed: 12902268]. [PubMed Central: PMC169142]. 18. Moradabadi A, Farsinezhad A, Fekri Soofiabadi M. [Fast method for diagnosis of leishmania by PCR and FLASH PCR]. J Arak Univ Med Sci. 2017;19(11):79-86. Persian. 19. Morad Abadi AR, Arjomandzadegan M, Emami N, Kahbazi M, Ahmadi A, Falahat S, et al. [Comparison of detection of clinical isolates of mycobacterium tuberculosis by flash PCR and conventional culture method]. J Arak Univ Med Sci. 2018;21(4):77-85. Persian. 20. Cunfer BM, Ueng PP. Taxonomy and identification of septoria and stagonospora species on small-grain cereals. Annu Rev Phytopathol. 1999;37:267-84. doi: 10.1146/annurev.phyto.37.1.267. [PubMed: 11701824]. 21. Khatami F, Heidari M, Khatami M. Rapid detection of Escherichia coli O157: H7 by fluorescent amplification-based specific hybridization (FLASH) PCR. Iran Red Crescent Med J. 2012;14(9):594-8. [PubMed: 23115724]. [PubMed Central: PMC3482334]. 22. Elfaki MG, Al-Hokail AA, Nakeeb SM, Al-Rabiah FA. Evaluation of culture, tube agglutination, and PCR methods for the diagnosis of brucellosis in humans. Med Sci Monit. 2005;11(11):MT69-74. [PubMed: 16258407]. 23. Fekete A, Bantle JA, Halling SM, Sanborn MR. Preliminary development of a diagnostic test for Brucella using polymerase chain reaction. J Appl Bacteriol. 1990;69(2):216-27. [PubMed: 2272943]. 24. Zerva L, Bourantas K, Mitka S, Kansouzidou A, Legakis NJ. Serum is the preferred clinical specimen for diagnosis of human brucellosis by PCR. J Clin Microbiol. 2001;39(4):1661-4. doi: 10.1128/JCM.39.4.1661-1664.2001. [PubMed: 11283112]. [PubMed Central: PMC87995]. 25. Probert WS, Schrader KN, Khuong NY, Bystrom SL, Graves MH. Real-time multiplex PCR assay for detection of Brucella spp., B. abortus, and B. melitensis. J Clin Microbiol. 2004;42(3):1290-3. [PubMed: 15004098]. [PubMed Central: PMC356861].